Village Underground aka VU was born in London more than 10 years ago. Since 2014 they’re at CARRIS (Lisbon’s Public Transports Company) Headquarters as a creative incubator space, a co-working community and a creative events destination. Mariana Silva brought the concept here and with the joint efforts of the Town Hall and CARRIS, this cultural hub was born. VU is part of Transeurope Halles, a European network comprising more than 50 independent cultural spaces. The Village Underground concept incorporates two distinct spaces: a working area for the creative community and a multicultural space. The place is next door to LX Factory but can be easily missed, but for a reference, they’re next door from LX Factory which means they’re literally under the bridge. 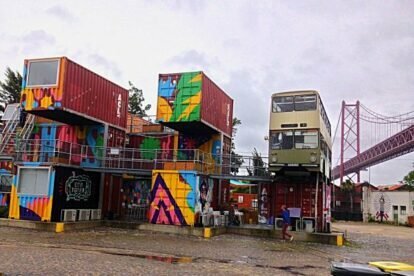 Inside, there’s two deactivated buses on top of big maritime steel containers and a cool coffee shop. There are also exhibitions, theatre and live music and the goal is to be a showroom of culture and a meeting point of artists and creative people. I love the whole place and it has a great progressive vibe! Hopefully they’re here to stay and promote new events and ideas. Check their cool coffee shop with a view, grab a sandwich and a coffee and start writing! Check their agenda for more info!